How to Make the Best Burgers | Cook’s Country – Recipes That Work. I could pretty much live on burgers and sandwiches if Michelle would let me. All these tips here from Cook’s Country can help you make a better burger not just for the grill but for inside as well. Check it out! I’ve been pretty busy with work lately so I’ve barely had time to do any blogging. As a matter of fact I’ve been completing neglecting my other blog the past few weeks so I could get work flowing. Hopefully I will get back to it next week. in the meantime, I am trying to stay with simple, easy dinners. This one even comes from a cookbook called “Simple Suppers” from Williams-Sonoma. It was a quick meal of chicken and tomatoes and makes a great one pot meal, although I did make some boiled potatoes along with it. In a large skillet over medium heat, cook the bacon, turning often, until crisp, 4 to 5 minutes. Using a slotted spoon, transfer the bacon to a small plate. Drain off all but 2 tablespoons of the drippings from the pan. Season the chicken with salt and pepper. Return the pan to medium-high heat, add the chicken and cook, turning once or twice, until golden brown on both sides, about 8 minutes total. Transfer the chicken to a plate. Add the onion and garlic to the pan and saute until softened, about 4 minutes. Pour in the wine and stir to scrape up the browned bits from the pan bottom. Stir in the oregano, red pepper flakes and tomatoes and their juice. Return the chicken and any juices from the plate to the pan, cover, reduce the heat to medium-low and cook until the chicken is cooked through, 25 to 30 minutes. Uncover the pan, increase the heat to medium-high, bring to a simmer and stir in the bacon. Transfer the chicken to individual plates, top with the sauce and serve immediately. The sauce that is made is delicious. The chicken thighs are ideal for this dish as well. The meat just falls right off the bone and is moist. Best of all, you can have this be a one dish meal and you are all done. Simple recipe, simple meal, simple clean up, simple blog post. I am planning to make some shrimp tomorrow, so we’ll have to see what I can come up with to make. Check back and see what I decide to do. Until then, enjoy your evening and enjoy your meal! Eliminating Early-Morning Coffee Problems | The Feed. Anyone who knows me knows I love a cup of coffee. I try to limit myself to 1 or 2 cups a day, but I want to make sure that they always taste good. Here are a couple of helpful hints from America’s Test Kitchen to make sure your morning coffee helps to get you off to a good start. Pair your cup with a nice piece of blueberry coffee cake and you are good to go. Check it out! While I have a few minutes of a break for lunch before starting up work again, I thought I would just pop in and give the recipe I made for dinner last night. I had seen this recipe on Food Network’s website and it sounded perfect for a weeknight meal when you need something quick and easy. I altered it slightly, changing up the kinds of peppers used in the recipe, but other than that I stayed pretty true. Heat 1 tablespoon of the butter in a large skillet over medium high heat. Add the sausage and cook until golden, about 2 minutes. Season the chicken with salt and pepper., then toss the chicken with the flour in a bowl to coat; add the chicken to the skillet and cook until golden brown but not cooked through, about 3 minutes. Add the onion, peppers,garlic, 1/2 teaspoon of salt, and pepper to taste and cook for 3 minutes. Add the wine, scraping up any browned bits; bring to a boil and cook until slightly reduced, about 1 minute. Add the broth and bring to a gentle simmer. Cover and cook until the sausage and chicken are cooked through, about 5 minutes. 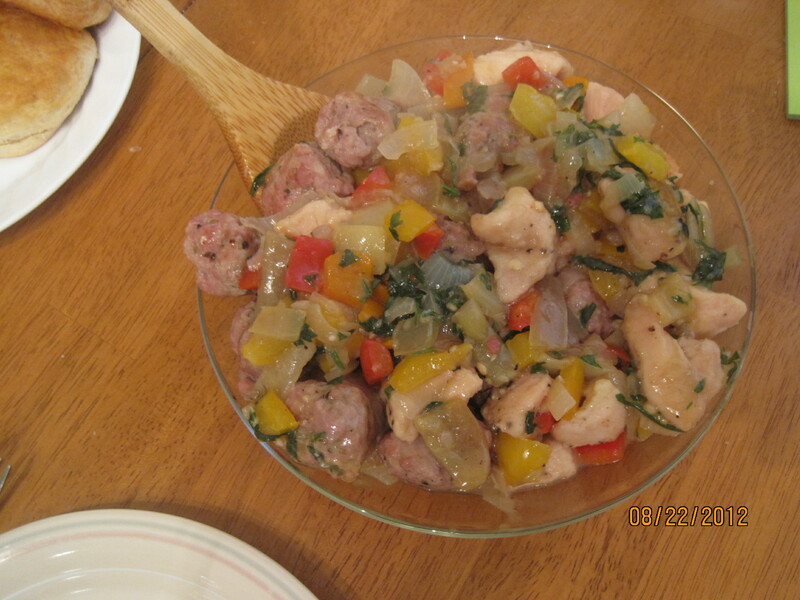 Transfer the chicken, sausage and vegetables to a platter with a slotted spoon. Increase the heat to high and stir the parsley into the skillet. ; boil until it is reduced by one-third, 2 to 3 minutes. Remove from the heat and stir in the remaining 1 tablespoon of butter. Pour the sauce over the chicken mixture. I served the meal with some white rice to round things out. For the peppers, I had bought a variety of colored peppers at the farmers market – red, orange, yellow, purple and white – so I used them all to make it more colorful. I would use whatever type of peppers you like best; if you want ones that will add some heat, get them and use them here and then use hot Italian sausage in the recipe. That’s it for today. I have a doctor’s appointment this evening so I don’t think there ill be an organized meal tonight. Check back tomorrow and see what I’ve got. until then, enjoy the rest of your day and enjoy your meal! There’ Nothing Better Than a Burger…Except a Steak Burger! I love burgers. I’m pretty sure I could eat one every day if it wouldn’t eventually kill me. There’s just something about a nice, juicy burger with all the accompaniments you like – bacon, tomato, lettuce, avocado, really anything you want – and it’s just plain good. I didn’t think there was too much else you could do to a burger until I came across this recipe for a Steak Burger from Cook’s Country. This burger is made from ground sirloin, which is why they call it a steak burger. Now the thing about ground sirloin is that there is hardly any fat in it at all, so you need to add a little fat to this to make it perfect. it’s nothing a little melted butter can’t take care of, and while you’re at it you can add a little spice to it as well. They also use a steak sauce on the burger to really give it some intense flavor. This recipe calls for the burgers to be grilled, but of course it was raining today when I started cooking so everything got moved inside. For the burgers, melt the butter in a large skillet over medium-low heat. Add the garlic, onion powder, pepper and salt and cook until fragrant, about 1 minute. Pour all but 1 tablespoon of the butter mixture into a bowl and let cool slightly, about 5 minutes. For the steak sauce, add the tomato paste to the skillet and cook over medium heat until the paste begins to darken, 1 to 2 minutes. Stir in the broth, raisins, soy sauce, mustard, vinegar, and Worcestershire sauce and simmer until the raisins plump, about 5 minutes. Process the sauce in a blender until smooth, about 30 seconds; transfer to a bowl. Add 5 tablespoons of the cooled butter mixture and the soy sauce to the ground beef and gently knead until well combined. Shape into 4 3/4-inch-thick patties and press a shallow divot in the center of each. Brush each patty all over with 1 tablespoon of the steak sauce. Combine the remaining 2 tablespoons of the cooled butter mixture with 2 tablespoons of the steak sauce; set aside. For a gas grill, turn all the burners to high, cover, and heat the grill until it is hot, about 15 minutes. Leave the burners on high. Clean and oil the cooking grate. Grill the burgers, covered, until the meat registers 120 to 125 degrees, 3 to 4 minutes per side, or 130 to 135 degrees (for medium), 4 to 5 minutes per side. Transfer the burgers to a plate, tent loosely with aluminum foil, and let rest 5 to 10 minutes. Brush the cut side of the buns with the butter-steak sauce mixture. Grill the buns, cut side down, until golden, 2 to 3 minutes. Place the burgers on the buns and serve with the remaining steak sauce. The steak sauce has just the right bite to it and tastes very good on the burgers. Of course, you can top the burgers with whatever you like to top them with. I prefer some sliced pickle, red onion and tomato myself, maybe a piece of bacon or avocado. You could just eat them with the steak sauce. I still had some of the remoulade I made a few days ago and used that. It was delicious. There’s no meal tomorrow since we are going to the Mets game at Citi Field tomorrow night, but I do have a dinner planned for Wednesday involving, chicken, Italian sausage and potatoes. Check back on Wednesday to see what it is. until then, enjoy your evening and enjoy your meal! It’s a beautiful Sunday here In New York and even though I should be doing some work, I feel like blogging instead. We went and got a load of great fresh vegetables at the farmer’s market in Goshen on Friday and then went to Adams Farms and got some meat and seafood so we are all set for meals this week. For tonight, I decided to make a couple of new recipes for us. I picked up some bay scallops that were on sale this week. They are the smaller scallops, and less expensive than the sea scallops. I don’t normally buy them because they usually aren’t chemical free, but these were so I decided to go for them. I found a good-looking recipe from Ina Garten for this one and decided to use that with some slight modifications. I cut this recipe in half from what is shown since there are only 3 of us for dinner tonight. Preheat the oven to 425 degrees. Place 6 gratin dishes on a sheet pan (I personally don’t own any gratin dishes, but I do have small ramekins I have used for pot pies, creme brulee, etc and I think these would work just as well, just make sure what you have is broiler safe if you plan to use the broiler later in the recipe). To make the topping, place the butter in the bowl of an electric mixer fitted with the paddle attachment (you can also use a hand mixer, which I am using because I didn’t want to lug out the Kitchen Aid). With the mixer on low-speed, add the garlic, shallot, prosciutto, parsley, lemon juice, Pernod, salt and pepper and mix until well combined. When the mixer is still on low, add the olive oil slowly as though you were making mayonnaise, until combined. Fold the breadcrumbs in with a rubber spatula and set aside. Place one tablespoon of the white wine in the bottom of each gratin dish. Pat the scallops dry with a paper towel and distribute them evenly among the dishes. Spoon the garlic butter mixture evenly over the top of the scallops. Bake for 10 to 12 minutes, until the topping is golden and sizzling and the scallops are barely done. If you want a crustier top, place the dishes under the broiler for 2 minutes until browned to your liking. Finish the dish with a squeeze of lemon juice and sprinkle with fresh parsley. A couple of notes on this recipe. Substituting bacon for the prosciutto is a convenience thing for me. I didn’t have any prosciutto and it can be kind of expensive, so I went with what I had. If you want the taste you get from the prosciutto, go for it. I also did not have any Pernod, which is a licorice-tasting liqueur. I couldn’t see buying a bottle just for 2 tablespoons, so I asked around on Twitter to some chefs on Food Network. Scott Conant replied to me to either leave it out completely or you can substitute in some vermouth instead. Amanda Freitag suggested using Sambuca instead, but warned it could be too sweet. I decided to go with the vermouth, but I think you could just as easily not use anything at all. With all these fresh veggies I bought on Friday, I wanted to make something with them. I decided to go for a ratatouille. Now, ratatouille seems to be somewhat of an old-fashioned recipe and a lot of the time, it just doesn’t turn out well. The veggies get too soggy and it can be a bit of pain to saute a bunch of vegetables separately and then combine everything. I found a recipe from America’s Test Kitchen that recommends roasting the ratatouille, which sounded ideal to me, so I gave it a try. Adjust an oven rack to the middle position and heat the oven to 375 degrees. Combine the eggplant, squash, onion, tomatoes with reserved juice, oil, garlic, thyme, salt and pepper in a large bowl and mix well. Spread the mixture into a 9 by 13-inch baking dish. Roast until the vegetables have softened and are browned in spots, about 1 hour, stirring thoroughly halfway through the cooking time. Sprinkle with the vinegar before serving. Again, I cut this recipe in half so it would fit just the 3 of us and it all worked out well. Normally, roasting vegetables doesn’t always work out too well since each can roast at different speeds. The temperature of the oven and length of cooking time seemed just right to keep everything from getting soggy and I didn’t have to spend a lot of time at the stove watching the vegetables, which was nice. This makes a great vegetarian dinner dish on its own if you wanted to do that. We also had some rice with meal to round things out. Michelle made a small batch of her Potato Leek Soup, which was great also. Tomorrow I am planning to make the yellowfin tuna I bought. I’m not sure what I am going to do with it yet, but I am sure it will be something simple. Check back and see what I come up with. Until then, enjoy your day and enjoy your meal!